Charged particles ejected with this coronal mass ejection (pointing down) can create a potentially dangerous environment for astronauts in space. Massive waves of energetic particles pose a serious hazard to astronauts in space. To help understand the radiation around Earth, the moon, and Mars, a team of scientists have developed a program to characterize the dangerous particles in near-real time. Known as PREDICCS, the program relies on measurements taken by a wide variety of space-based telescopes to characterize radiation at regions in the solar system likely to be frequented by astronauts in the not-too-distant future. "This is the first capability of its kind to determine the radiation environment and to specify it more or less in real time," Nathan Schwadron, PREDICCS lead developer at the University of New Hampshire's Space Science Center, told SPACE.com. Radiation from the sun, either constantly streaming or spiking with solar flares and coronal mass ejections, poses a danger to astronauts in space. 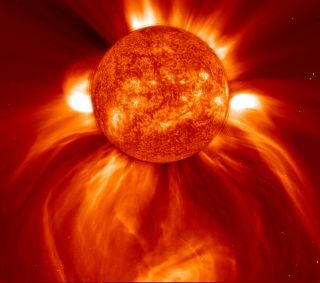 In this artist's image, radiation streams away from the sun along the (blue) curved magnetic field lines, arriving before the (orange) cornal mass ejection. Radiation levels in space are constantly shifting, creating potentially hazardous environments for astronauts. During particularly high periods, astronauts may need to hunker down behind strong radiation shields, limiting their activities until levels are once again safe. PREDICCS relies on data from a variety of spacecraft such as NASA's SOHO, ACE, STEREO, Wind, SAMPEX, and the National Oceanic and Atmospheric Administration's GOES satellite to determine time-dependent radiation exposure in space. "We end up utilizing the best available observations at any given time," Schwadron said. After collecting measurements from different locations, it simulates the levels of energetic particles at regions where astronauts are now or could visit in the future. The team can then compare PREDICCS data with measurements taken by instruments such as NASA's Lunar Reconnaissance Orbiter at the moon or NOAA's GOES satellite orbiting just above Earth. The program typically predicts radiation doses within 20 to 30 percent of observed levels. Space radiation comes in two different forms, and both can be harmful to astronauts. "The fluxes of solar energetic particles rise very quickly in less than an hour," Schwadron said. "There's very, very little warning." At the same time, sources throughout the Milky Way shoot high-energy particles known as galactic cosmic rays across the galaxy. The energy from galactic comic rays, or GCRs, is more constant, but it does slowly change over time. The sun's magnetic field serves as a shield, blocking most GCRs, but when the field weakens during the minimum portion of the sun's eleven-year cycle, more particles can make it through. Like X-rays at the doctor's office, the high-energy particles can pierce delicate biological systems. Short-term dangers include radiation sickness; long-term exposure could result in cancer. Earth's atmosphere blocks most of these hazardous particles, but astronauts in space have to bring their own shielding. PREDICCS is still in the early stages, as Schwadron and his team continue to get a sense of the best ways to optimize the program. "Right now, we're doing one-hour updates," he said. "In the future, depending on demand, we'll probably get it down to minutes." PREDICCS will be able to integrate data as it comes in from other sources. For instance, the Mars rover Curiosity carries a Radiation Assessment Detector, a tool which, among other things, measures how much radiation penetrates the atmosphere of the Red Planet. The developers intend to fold the measurements taken by the rover into their computer program. "If we had men going to the moon tomorrow, we could certainly use something like PREDICCS to provide day-to-day, hour-to-hour updates as to the hazardous environment," Schwadron said. At present, the program simulates the radiation a region currently experiences but does not forecast future events. But according to Schwadron, such predictions aren't completely out of the realm of possibility. "In principle, if we had the right tools available, we could in fact provide several-hour forecasts," he said. "But at this time, we're sticking to characterization after the fact."